Do you want to add some Volume, Color, and Length? Sanctuary Salon & Spa has the answer for you to achieve the hair style of your dreams. 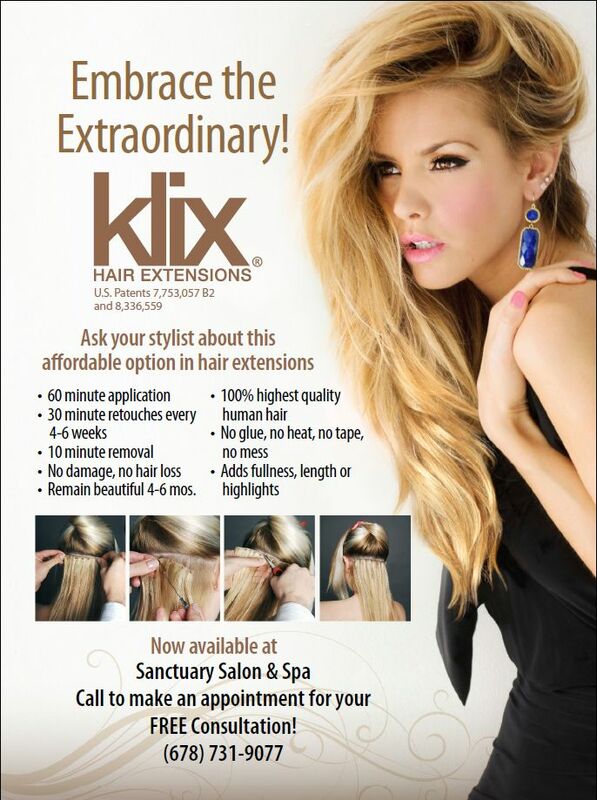 We are now offering Hair Extensions in Atlanta by Klix, and this patented system allows us to apply a full head of extensions in about 60 minutes or less. Our clients deserve the best quality & care when it comes to adding hair extensions. The application requires No Heat, No Glue, No Tape and requires no chemicals for removal, which is safer and healthier for your hair. We use extensions made of 100% Remy human hair and are the best quality with an intact cuticle. The extensions remain untangled due to threading of each strand by hand into each weft with a root to end direction. These wefts attach to your hair by micro-links, which are lined with silicon to protect your hair. This application of extensions when seamlessly applied by our certified Hair Stylists gives you an adoringly natural and shiny hairstyle. During your consultation we will discuss the results that you want to achieve by wearing hair extensions. You will be able to choose textures and colors available to design your new hairstyle; we will then schedule you an appointment to apply extensions to your hair. During the application appointment, we will apply your Hair Extensions (the process should take approximately 60 minutes). Then we will cut and style the new hair extensions and recommend products and teach you the new maintenance routine. It is a perfect time to schedule the re-touch appointments. Every 4-6 weeks we will open the micro-links, slide the hair extensions back up closer to your scalp, and reclose the micro-links (this should take approximately 30 minutes). The re-touches will continue every 4-6 weeks until it is time for a new set of hair extensions. If we color your hair, this is also the time that we will do a color touch up before adjusting the hair extensions back up closer to your scalp. With proper care and maintenance, your hair extensions should last between four and six months. When it is time for this, we will quickly open the micro-links and slide them out of your hair. The removal time takes approximately 10 minutes.